I believe in the power of school to school support and sharing great ideas which I have seen succeed across the South West. During 2019 I’m tackling 19 different events raising money for Winston’s Wish. They’re a wonderful charity who do great work supporting children and their families after the death of a parent or sibling. 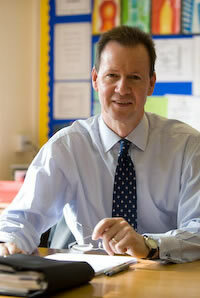 I’ve taught for thirty years, twelve of them as Head Teacher, and received a Lifetime Achievement in Education award. During those twelve years we transformed our school into one of the top 100 nationally for improved and sustained exam performance. We became a happier, healthier school. Now, as a consultant, I’m passionate about passing on what I’ve learned to the next generation of school leaders. Please get in touch on 07786735263 or email me at info@peterrowlandeducation.co.uk to find out more about how I can support your school or organisation. Every teacher needs to improve, not because they're not good enough, but because they can be even better.